Concrete blocks are easy to install and durable. All structures made from this material will easily stand the test of time and look great. These blocks make the installer’s job easier, which reduces the cost and makes the project easier on your pocket. At Scapes and Stones, we use blocks for different kinds of structures, including retaining walls, outdoor structures, and outdoor kitchens throughout greater Las Vegas, NV and surrounds. 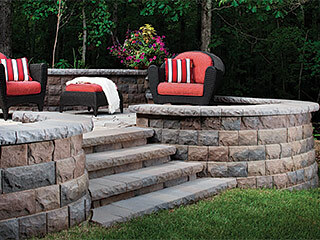 Block retaining walls are affordable, easy to install, versatile, and effective. They help prevent soil erosion, keep your landscape in place, and allow you to create relatively flat surfaces on a sloping terrain. That’s one of the reasons why these blocks are used quite often in modern retaining wall projects. We like the use this material because the job is done quickly and the walls are resilient. Unlike brick and other such materials, concrete blocks don’t easily degrade over time. They also don’t crack or bend like poured-in concrete walls. That’s one of the reasons we recommend this material to all our clients. If you want to give your wall an old-school Irish or Scottish finish, Celtik concrete wall blocks are a great option for you. The blocks have an uneven, rough finish that makes them look like they’ve been cut by hand and they mimic the natural appearance of stone. It’s very difficult to tell the difference between real stone and Celtik blocks so your landscape looks rich and luxurious. The blocks are also available in different colors and sizes, which makes them ideal for all kinds of wall applications. You can choose colors like brown, gray, black, and beige, etc. Have you ever visited a castle? If you have, you might’ve noticed the uneven but strong walls that are made from natural stone. These walls look great and are resilient enough to withstand centuries of wear a tear. You can achieve that similar effect on your property with the help of masonry blocks that are designed to look like natural stone. We can install castle walls on your property easily and will use stackable cement bricks to create something that looks natural but is affordable. Natural stone is very expensive and difficult to work with but concrete blocks are easy and are available in different looks and finishes. We will ensure the castle wall looks as close to the real thing, as we can get it. 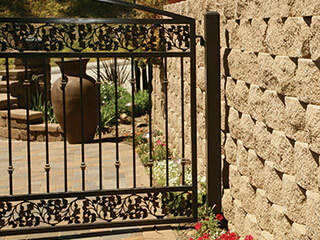 Concrete blocks are a great alternative to traditional materials like stone and brick. They’re not as fragile as brick or as expensive as stone, which makes them an ideal option for a large number of our clients. If you want to know more about concrete blocks, don’t hesitate to get in touch with us at Scapes and Stones. Speak with our experts at this number 702-278-3228 and give us some more details about your project. You can also contact us through our online form and we will respond shortly.